Dirk is a former enduro champion, so he knows a bit about evoking the spirit of race bikes—and making them perform. 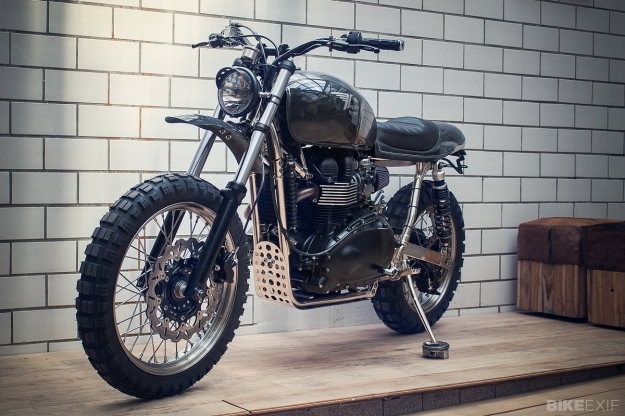 He hauled a Triumph Scrambler 900 into his Gelsenkirchen workshop and broke it down into bits. He them chemically stripped the frame, adjusted the top beams and rear subframe, and spent several days hand-polishing the result before sending it away for nickel plating. 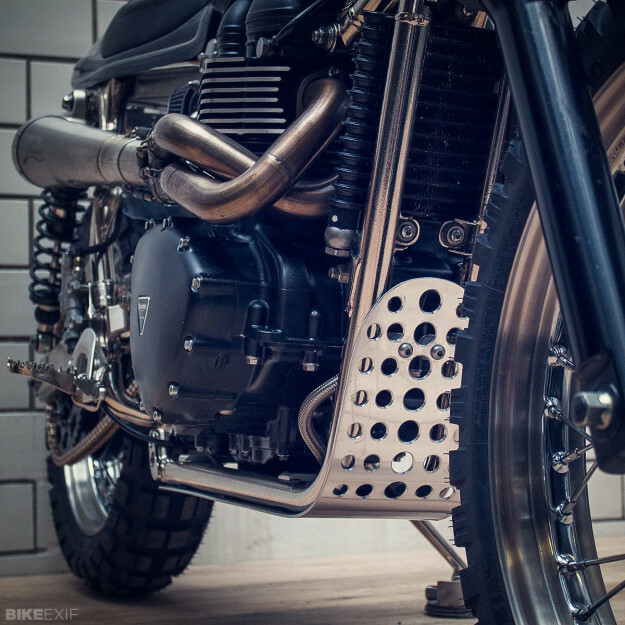 The Scrambler engine is strong, with a 270-degree crank giving an offbeat exhaust note, so Dirk left the engine internals alone. But induction is now via K&N and there’s a free-breathing Arrow exhaust system with a custom-made muffler. The brake system is a mix of Yamaha and high-end Nissin RFX components, connected via LSL brake lines. 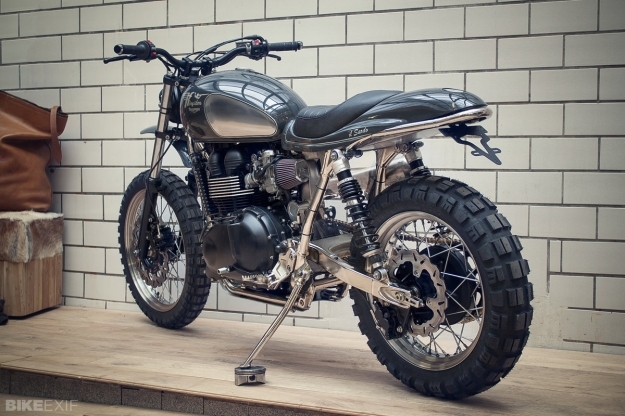 LSL have provided the bars and front fender too. Dirk stripped out the electrical loom and installed a minimal replacement, hooked up to a Triumph-specific Motogadget m-Tri signal adapter. The m-TRI hooks into the CAN Bus and handles the feed to the new Daytona Velona instruments, plus indicator and lighting controls. The headlight is a classic Bates item with a neat visor. Out back are 370mm YSS shocks, and the tires have been upgraded to Mitas E-10 for extra grip on the grassy sprint track. “My goal was to build character and charm into the bike,” says Dirk. 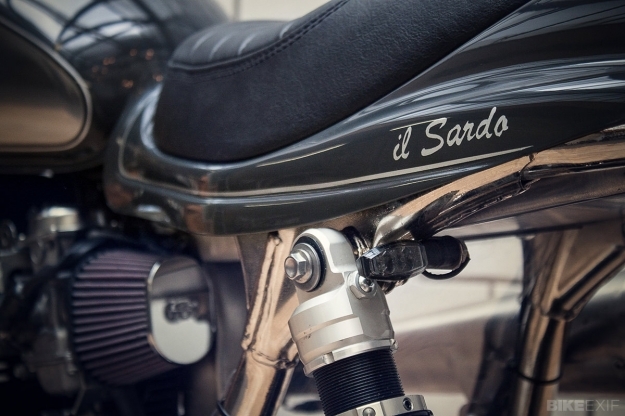 Another goal was to lose weight: Il Sardo tips the scales at just 189 kg, some 40kg less than a showroom Scrambler. And the name? 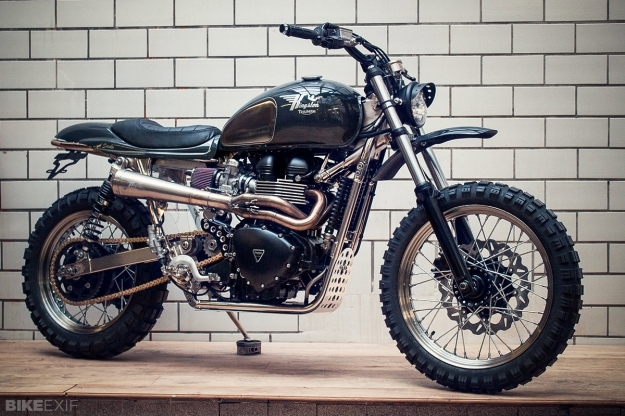 “Uli Brée asked if the Scrambler could appear in a music video being shot in Sardinia. “The name ‘Il Sardo’ refers to a strong and characterful local, someone who is down to earth and honest,” says Dirk. To see more of Dirk Oehlerking’s work, head over to the Kingston Custom website or Facebook page.